He was at the time speaking to local media houses following a consultation meeting with Florida Caribbean Cruise Association Operations Committee on May 14, 2018, at the Moorings Conference Room. “I can’t answer the question as to when we might bring the vessel back yet. So it’s not just the roads are fixed and we come back. We have to look at the safety and security of our guest and the families that we bring to the island and to the territory. 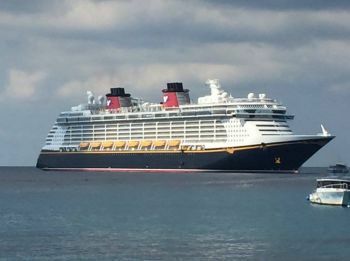 So that will take some further evaluation,” explained the Disney cruise line representative. Meanwhile, Mr Daya pointed out that he has asked the government to provide him with weekly updates from the different areas where the tourist attractions are located and based on those updates he will be able to “accurately and timely assess progress that is being made” which will ultimately help him to decide when the Disney Fantasy cruise line will return to the territory. Meanwhile, Mr Daya explained that when he visited Cane Garden Bay, one of the main tourist attractions, he noticed some safety concerns in regards to infrastructures that were being rebuilt, adding that he looks at perspective through the eyes of a child. He added that his guests understand that the territory was devastated and is slowly rebuilding but added that his cruise line will “never rush back to a destination until they are 100 percent satisfied." "The BVI is defiantly moving in the right direction. It’s been about three and a half months since I’ve been here." Did you all mean definitely? Definitely and/ or defiantly, ( The BVI is moving.....OK? What a shame when someone has to come and tell you how to clean up your own place, especially when you rely on that place to make money. You are in need of a cleansing. Spice it up for the media but still nah come. Hehehe what a Mickey Mouse story. Why don't you offer suggestions or are you just good for blah blah and crticism. Really need to wise up or hush up is my suggestion. @ @ wize up(G.F.Y)...make me!!! Wow wise up! You actually let someone push you into talking like that? Ignore these fools and show you are the better person without using profanity. Lol lol ...make me!!! That about quacks it up in a nuthell folks. Mr. Daya ain't lieing the place has more to go before bringing their customers here. Be that as it may; how much will this co$t Pier Park in lost revenues from rent and businesses? How has this affected BVIPA revenues and it's ability to re-pay debts/obligations? What is or how much is the impacted financial loss for this??? Anyone...? BVIPA is running on empty thanks to the same Pier Park. And to this day no-one in jail. Sins of a country. Almost 10 months after Irmaria, these islands aren't ready for cruise tourism? Why didn't the government did like what we did here in the USVI where we worked with the cruise industry to determine a road path that led to Magen's and back to the cruise port, making sure that road paths was pristine on both sides ensuring the rewelcoming of cruise passengers in November? Leadership is key especially after such catastrophic events and its obvious that sound planning is whats missing here! All the minister and his premier give us is spin and not a thing in action.........where is the so called action man now ? The only man who talk truth is the man in the first who is on record in stating the this government tell a lot of lies !!!!!! Mr. Daya is correct.Get your Island in order and we will come back. Safety is the number 1 factor.
. They give me the " jibbies" . There has got to be another way. With the electronic age in full swing , "silicon valley" type enterprise and a full blast nature preserve....man the young people must brainstorm and forge a new and different approach to creating income...don't like an abundance of these tourists at alll...too much bad vibes and infiltration of ill well...The Will I T debacle is a perfect example of and demonstration of the callous disregard and disrespect. The legendary animosity of the oppressors is endemic and that cannot change, For now tourist dollars yes but with an eye and planning for a way that is more conducive to maintaining our respect, self worth. Some folks are simply scary even when not clothed in a white hood. The cruise ship passengers is now booking cruises to other Caribbean Islands, Mexico, Canada and the Mediterranean. It seems other Caribbean Islands value the tourist industry. Sorry guys but, you are not serious about tourism. I totally agree with Mr.Daya. Tourism is a double edge sword. It comes with devaluation and North Americans are the frontrunners and purveyors of this unpleasantry. To survive with our dignity in tact, the forced reduction of tourist would be a blessing . A different industry sans tourist would eventually evolve and with it a welcome reprieve from the voyeuristic and disrespectful and destructive nature of tourism en masse. I am one who welcomes the reduction in tourism and tourists but realize that there are those whose livelihood is tourism dependent. My sympathy. Relocation might be a solution for some. But if you dont help the situation well how can we move ahead.It not gonna happen over night but i am certain every visit you gonna see some form of improvement.The tourist dollar will surely help in improving us to get better roads taxis beaches etc.Many are still owing for their mortgages there are many mouths to be fed bills to be paid. You see if that cruiseliner is to be affected by an disaster you may say otherwise as that shoe is not on your feet at that moment and you may also lose your job and be hustling and bustling around to find another. Many are trying their best to make ends meet and you come here chatting fart just reach out and help some way or the other tomorrow the shoe might be on your feet. Another hurricane season is upon us and who knows your liner may not be able to roam the seas or who knows be caught in a storm.Dont be selfish or act selfish reach out and help your brother man. Who knows one day we may reject your liner from gracing our shores.BVI and others need the love and support right now more than anything. Put some love in your heart and be Christliked. Every small island depends on tourism, that’s a fact. We need to hurry up with the cleaning and rebuilding. We haven’t even started getting the grant money that was promised to us to help rebuild and at least put our roofs back on. Once roofs are on, we can work inside and tourists cannot see the damage, but without roofs, the rain keeps pouring in, so we cannot fix it. We need to keep our roads clean and pothole free, for our own safety as well as visitors. Hurry up with the grant money before the next hurricane does us in because we have no cover.